Here is a scan of a cookbook from my Mom’s collection. 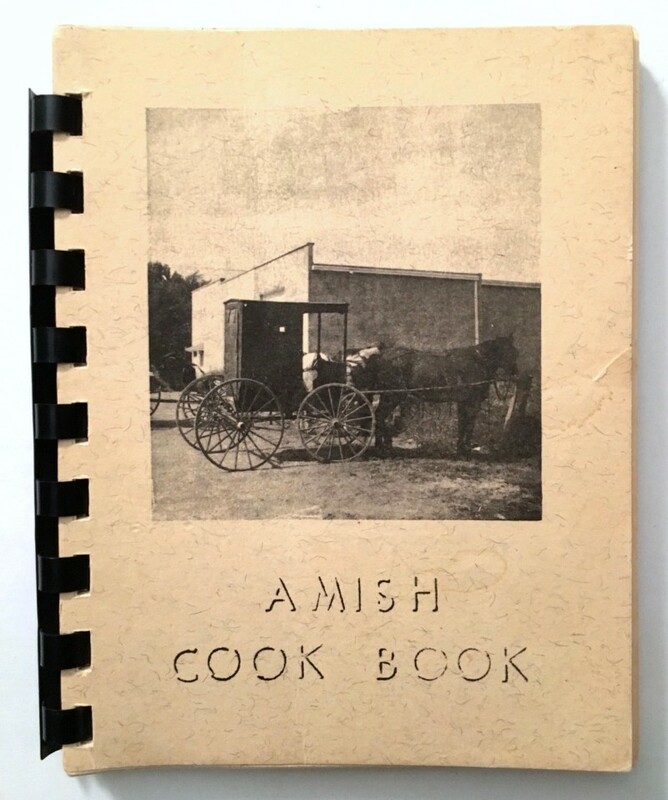 It is entitled “AMISH COOK BOOK of Recipes from Our Amish Neighbors” and was published by the Grace Methodist Church of Oelwein, Iowa, Woman’s Society of Christian Service. It is undated but I believe it was produced in the early 1970s. This tiny 4.25 by 5.5 inch booklet has 112 pages and was produced on a script typewriter with hand drawn illustrations. Click on this link to download the booklet as a 68.7Mb PDF file. Thank you for this book. I want to compare some of the recipes I have that were from my grandmothers and great grandmothers. Both sides of my family have Amish ancestry, from IN, OH and PA. Thank you so very much in sharing this cookbook. I collect church cookbooks from across the country, and find it just fascinating how each church or family change an ingredient to suit the dish from where they live to make it work. Thank you so much for the book. My fathers family were all from Lancaster and Lebanon Counties so I grew up eating PA Dutch and Amish Food. Thank you for the cookbook. I looking forward to trying some new recipes. How nice of Charles Eicher to send this cookbook in PDF! That way all of us can enjoy downloading and saving it. The recipes look very interesting and I can’t wait to try some of them. A BIG thank you to Kevin for putting this up for us to download. I so enjoy your newsletters and all the recipes and articles you share. What a precious book! Thank you to Charles for sharing it and to you Kevin for sharing with us as well. Enjoying reading the recipes and may even try a few! Thank you so very much for sharing this cookbook. I love church cookbooks as well as Amish recipes so am most appreciative for this one. It was so kind of Mr. Eicher to share it with us. Fantastic. Thanks so much for finding this and sharing with us. Love your blog. Thank you for theses easy recipes they remind me of my childhood. Thank you so much for the Amish Cookbook. I have been wanting some of those recipes but I have been searching for the Sweet Dill Pickle recipe forever. I found a recipe that I have been using to turn dill pickles into sweet dills but I wanted the one to make them from scratch. There are so many old recipes in this book that I want to print it out to keep in my kitchen. Love it. Thank you!